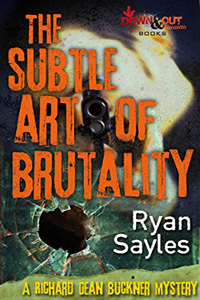 Today is the publication date for THE SUBTLE ART OF BRUTALITY, the first in a new series featuring private investigator Richard Dean Buckner by Ryan Sayles. In his first case, a girl has gone missing. Again. But this time people are trying to kill her. Trying to burn down everything she has touched or left behind. The girl’s surrogate father feels responsible and to assuage his guilt, he hires Richard Dean Buckner, former Saint Ansgar homicide detective turned private eye to ferret her out. THE SUBTLE ART OF BRUTALITY is available in trade paperback and ebook formats. For a limited time only, you can purchase the Kindle format for $1.99!